HIGH END TECHNOLOGY AT A VERY AFFORDABLE PRICE!" The Compumatic XLS 21 system is the perfect automated time & attendance solution for your small business. 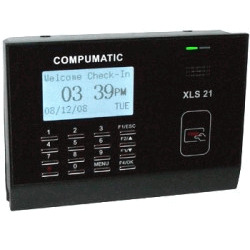 The Compumatic Employee Time Clock comes with a complete package which includes the Compumatic XLS 21 terminal, CompuTime101 software for 25 employees, 25’ RS232 cable, 5' Ethernet cable, mounting bracket, hardware, instructions, and AC power supply. Easy Setup + 90 Days FREE Setup Support! CHOOSE PIN ENTRY PACKAGE OR PROXIMITY BADGE CARD PACKAGE.